We have worked with this exceptional outfitter for about 10 years, sending him dozens of clients. 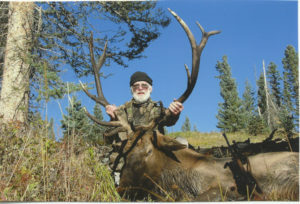 Over the last decade shooting opportunity on elk hunts for his clients has been virtually 100%. One client went home empty, after passing up 12 bulls including a couple over 300 B&C. The years since then have shown very similar results with 90 to 100% opportunity on good bulls. The success rate remains high regardless of which ranch you hunt. 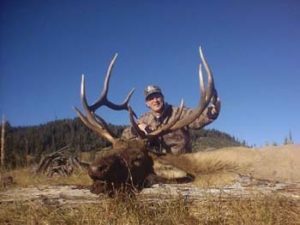 The outfitter has extensive elk, deer and antelope guiding experience, has worked as a world-class rodeo cowboy and is a fine gentleman besides. The outfitter has demonstrated great ability and has a proven track record of high success for our clients. 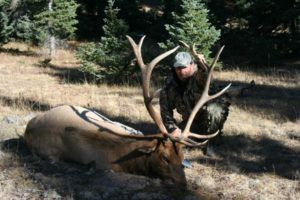 The operation has been featured in several of the Primos Truth series of videos, calling in elk for archery shots on camera and also on antelope. 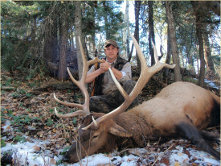 NEW MEXICO ELK w/RIFLE or BOW: Unit 4 rifle hunts usually start on or about 10/1, so bugling bulls are normally heard. Bugling can go on for much of October. The outfitter’s guided hunts are five days and the price INCLUDES the landowner tag, (typically these landowner tags alone cost over $2500 to as much as $3500!). This means you avoid having to draw a tag; just book and go hunting. The hunts take place on private lands near Chama, in the heart of some of New Mexico’s prime elk country. Rustic ranch-type accommodations—no tents! Two camps, one is higher and about 35 miles off the beaten path on dirt roads and is the more remote camp. No electricity, but have a generator. The other has electric. Both have shower facilities. Meals are included. You still must purchase a license, but it is over the counter using the landowner voucher. On all the ranches he hunts you can expect above average elk, with most being 6 x 6 or good 5 x 5 bulls. You are not likely to kill anything over 320, although it can and does happen. Most are solid mature bulls that our clients are quite happy with. The moisture level here has held up better than other areas such as the Gila, meaning better forage in general. The Chama area is world famous for its elk population and its very scenic country. Almost all of the unit is privately owned, so there’s no public hunting pressure. Superb archery hunts are also available with landowner tags included in the price- AGAIN NO DRAW! Archery season starts Sept 1 and runs thru the third week of September. The outfitter’s best elk taken by a client to date was a 370-inch class brute. Normally bulls run 270- to 320-inches Bonne & Crockett. You’ll have the pleasure of seeing plenty of elk on these hunts. It is typical to have multiple close encounters. Stay in comfortable facilities with excellent elk hunting for both gun and bow. GUIDING 2 x 1 (two hunters per guide); 5 days of hunting. LICENSE – APPROX. COST: $556. NEW MEXICO SALES TAXES (pay direct to outfitter upon arrival in camp- 6.8% -we cannot collect taxes. This is an excellent outfitter, who hunts premier private ranches, who knows how to hunt trophy animals, and who provides great success for his clients. Since landowner tags are very expensive throughout New Mexico, these hunts, while not cheap, are still relative bargains. Due to many re-bookings, you should call us quickly if you have an interest in any of these hunts. This outfitter also offers West Texas whitetails and mule deer. There is lots of EXCELLENT habitat, plenty of deer, and plenty to shoot at. They will also do rattling hunts during the rut, to call in those aggressive Texas big boys- great fun to see a big buck come tearing in- hair standing up straight, ears laid back- looking for a fight! They hunt both from stands and spot and stalk, varying with whatever is working best at that time. This ranch is a bit under-hunted, to allow age to accrue on these bucks.. Hunts are 5 days of hunting, with 6 nights. Hunts include guiding, lodging and meals. Guiding is 2X1. Lodging is in a ranch house, plenty solid, just not fancy. Good food and good guides. One plus is you can combo with both a mulie and a whitetail if you wish!! Hunts take place in November and December; tags are over the counter and you can take predators and hogs and no extra cost. Whitetails hear are 125 to 160 and mule deer are in the 150 B&C class. Normally almost 100% opportunity and about 90 percent kill. Fly to Lubbock and rent a car for the 2 hour drive. deer is 5 days, 6 nights $4,500. **Landowner elk vouchers(New Mexico) are guaranteed as are Texas Mule Deer and Texas Whitetail Deer. New Mexico Deer licenses are subject to draw.